I've been grappling lately with the tradeoff between time to market and political expediency. 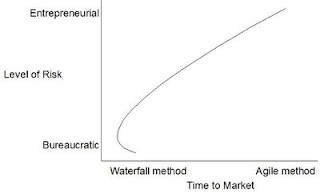 In a nutshell, time to market can be described as a continuum between rapid prototyping and agile development methods on the one hand, and traditional business development waterfall methods on the other. The traditional methods focus on identifying and understanding as many variables as you can before you launch to market - a think before you act approach. In contrast, the rapid prototping agile methods favour an act before (or rather while) you think approach - basically launching with an educated guess and and refining your proposition depending on the response it receives. The best method for any given situation will most likely fall somewhere between these two extremes. And finding exactly where the right method for your project falls will involve some assessment of the political risks, as determined by the sponsoring organisation's culture. A more traditional bureaucratic culture will favour a more traditional business development waterfall methodology and will shun the risk associated with a agile method. Similarly, a more entrepreneurial culture will favour a faster time to market and will be more comfortable with the level of uncertainty and risk involved. This trade off between time to market (return) and political risk (risk) reminds me of the tradeoff between risk and return in investment theory. And so I wonder if there is some sort of efficient frontier that you can calculate for projects and project portfolios. If the analogy holds, then the trade off is not equal across the range (that is, there is a curve in the line on the graph to the right), and there is some theoretical attitude to risk which can be used to determine the sponsoring organisation's optimum risk / method tradeoff. An understanding of that, even at a conceptual level, should help a project manager pitch his/her project correctly for the organisational culture in which he/she must operate. Get it wrong, and you run a different risk - the risk of squandering the window of opportunity for your proposition. That is, if you do not pursue the most aggressive method that the sponsoring organisation's attitude to risk will tolerate, you risk coming to market later than is absolutely necessary, and possibly missing the window of opportunity altogether. For that reason, some organisations - those with bureaucratic cultures and low tolerance for risk - will never be able to deliver quickly enough to take advantage of opportunities in rapidly developing markets with opportunity windows that close quickly. And so sponsoring organisations need to target markets which are amenable to their appetite for risk.